The electrical system is an important, and potentially hazardous, part of a home, which is why it is included in every thorough home inspection. Read on to learn the 10 most commong electrical issues found within homes. 1. Improper wire junctions/terminations – where two or more wires meet, this wire junction is required to be wire nutted and enclosed in an approved junction box. This is required for several safety reasons, namely to help limit a shock hazard. 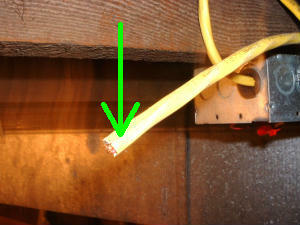 Where a wire stops (terminates), it should also be wire nutted and enclosed in an approved junction box. Even if the wire is no longer in service or live, years down the road someone could connect something on the other side of the home and all of a sudden this unterminated wire can become energized and create a shock hazard. It is best to be proactive and properly protect the wire now. 2. Buried Wiring – To safely bury wiring underground, only wiring approved for direct burial use, such as a rigid conduit, should be used. Imagine burying household Romex wiring in your back yard, forgetting it, and hitting it with your shovel next spring when planting flowers. Ouch! Hitting conduit with your shovel will alert you to the fact of underground wiring, and also prevent you from slicing through the wiring and getting the shock of your life. 3. Ungrounded receptacles – in the early 1960s, electrical codes changed to introduce 3 wire grounded receptacles to residential homes. The grounding conductor (the round pin in a 3 prong receptacle) is designed to give electricity a safe place to discharge should something go wrong with an appliance or in case of a nearby lighting strike. Homes from before 1960 were not wired with 3 conductor wire, but were instead wired with only a 2 conductor cable. Often, someone will replace an old 2 wire receptacle with a new 3 wire receptacle. 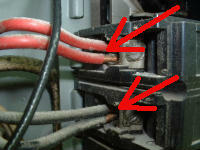 If the wiring to the receptacle is not replaced and grounded properly, the result is an ungrounded 3 prong receptacle. Just by looking at a 3 prong receptacle, one normally assumes it is grounded. If ungrounded 3 prong receptacles are present, there are several ways of correcting the issue. The receptacle can be changed back to a 2 wire type, the wiring to the 3 prong receptacle can be replaced with new Romex and grounded, or a Ground Fault Circuit Interrupter (GFCI) receptacle can be used (assuming it is labeled ‘No Equipment Ground’). 4. Knob & Tube Wiring – this type of wiring is the original type used in homes from before 1950. The conductors for this type of wiring are separated, unlike later sheathed cable that had the insulated conductors wrapped together. Knob and tube wiring needs to be closely evaluated by a licensed and qualified electrician. Because of the age and lack of capacity, it is generally inadequate for today’s usage. 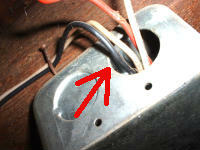 Old knob and tube wiring tends to be brittle which can lead to arcing and fires. 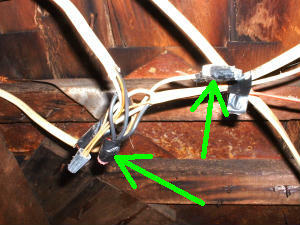 Also, junctions in knob and tube wiring tend to not be consistent with today’s wiring and safety standards. Often, knob and tube junctions are found only soldered or taped which is not sufficient per today’s standards. Also, some insurance companies will not insure homes with knob and tube wiring. A thorough inspection of the home’s active knob and tube wiring by a licensed electrician is recommended, although replacement of active knob and tube wiring is most often wise for fire safety reasons. 5. Missing Wire Bushings/Clamps – wherever wiring enters a metal junction box, metal appliance, etc., the wiring is required to have wire clamps to protect the wiring from mechanical damage or abrasion. For example, the vibration of a garbage disposal can slowly slice through wire insulation. A shock hazard can occur once it gets to the live conductors. The wire clamp holds the wiring in place so it can’t touch the metal chassis or junction box. 6. Extension Cords – We all use them occasionally, but extension cords are not meant to be used as permanent wiring. Often, people use extension cords to power things like outside fountains, garage door openers, and lighting, but extension cords are meant for temporary means; not to be used in place of what should be permanent wiring. Should power be needed where there is not currently an accessible receptacle, a licensed electrician can often install a new receptacle where needed. The National Electric Code (NEC) rule regarding maximum distance allowed between receptacles comes from the fact that they are trying to greatly minimize the need for extension cords. Since most lamps come with 6’ cords, if the maximum spacing allowed between receptacles is 12’, one should not need to use an extension cord to power a lamp. 7. Double Tapped & Double Lugged Circuit Breakers – circuit breakers are normally designed to accept one (1) wire safely. Some brands of circuit breakers (such as some made by Square D) are designed to accept two wires since they have a special clip for each wire. Terminals for more than one wire must be specifically identified for this purpose, either within the equipment instructions or on the terminal itself. Generally, the term ‘double tapping’ means having multiple wires connected to the location where the main service cable connects at the main breaker. 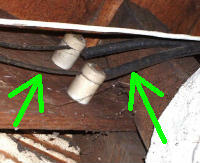 Double tapped wires are often lacking over-current protection which can lead to overheating and fire. Also, most circuit breaker panel manufacturers have specific torque and wire size requirements to safely allow for only the main electrical service cable. The term ‘double lugging’ is similar but applies to individual branch circuit breakers. If only one screw exists to accept a wire, that normally means only one wire should be connected at that breaker. Connecting more than the allowed number of wires to a circuit breaker can overdraw the circuit and can also prevent either wire from being properly secured at the breaker. Loose wire connections can lead to arcing and fire. Some correction methods (depending upon the panel) include installing additional breakers or installing an auxiliary subpanel. 8. Improperly Wired Receptacles – Electrical receptacles are designed to have specific wires at specific terminals. A polarized receptacle (one with a longer vertical blade than the other blade) will allow a polarized plug to be fit into it in only one direction. The small blade (when installed properly) is connected to the hot (black) wire. The larger blade (again, when installed properly) is connected to the neutral or grounded (white) wire. 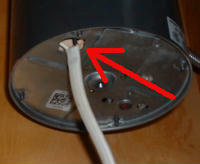 The round pin is connected to the bare (grounding) wire. Circuit testers are sold at hardware stores which can identify improperly wired receptacles. When the hot and neutral wires are reversed, the issue is called reverse polarity and can be a shock hazard. In most circumstances, repair is fairly easy and not time consuming, but should be performed by a licensed electrician. If the hot and ground (bare) wires are reversed (Yes, I’ve seen it happen! ), it is even more of a serious safety issue and should be addressed immediately by a licensed electrician. It would also be wise NOT to use this receptacle until it is repaired. 9. Non-Functional GFCI Protection – Ground Fault Circuit Interrupters (GFCI) can be in the form of a GFCI receptacle or a GFCI circuit breaker. GFCI protection is now required (for new construction) in areas where electricity and water can potentially meet. At different points in time since 1973, GFCI protection requirements have added more locations around the home. Currently, for new construction, GFCI protection is required in bathrooms, unfinished basements, garages, exterior receptacles, and most kitchen receptacles. A GFCI is designed to monitor the amount of current going into the receptacle through one wire versus the amount of current coming back out of the other wire. If a lower amount is coming out than what is going in, it assumes the difference must be shocking someone and should trip. For example, 5 Amps going in but only 4 Amps going out the other wire. The missing 1 Amp must be shocking someone and ‘POP!’ the GFCI trips. When a GFCI receptacle ‘trips,’ the little TEST button pops out and shuts down the circuit. When a GFCI circuit breaker ‘trips,’ the breaker handle goes from the ON position to a middle position. GFCI circuit breakers also have a TEST button. 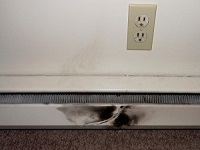 A problem that is not uncommon with GFCI protection it that is simply stops protecting. Should a GFCI not trip when the TEST button is pressed or the device not reset, it is best to replace the GFCI protection device. These are inexpensive but a very good safety device. 10. Improperly Wired Subpanels – Subpanels are often installed in a home if the original breaker panel is full of breakers and an extra circuit(s) is needed or if an addition is done to the home. A subpanel is a breaker panel (may have one or many circuit breakers) that is downstream of where the home’s main service disconnector (aka main breaker) is located. 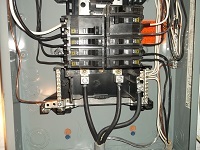 The home’s main breaker panel is the enclosure that has the main electrical service disconnection means for the building. Most homes have only one breaker panel that includes the main breaker and breakers for the home’s circuits, but some homes have both. A subpanel may be a few inches from the main electrical service disconnect or may be on the opposite side of the home. In subpanels, the neutral (normally white) conductors must “float” and may not be connected to the electrical system’s grounding system (including the subpanel’s chassis). “Floating” conductors simply means, in this case, that those wires are isolated from ground. The above condition can present a potential shock or fire hazard as objectionable currents will not be prevented. “Objectionable Currents” is electrical energy that is traveling on a metal conductor (such as a wire, metal appliance, metal pipe etc.) that is not supposed to be carrying electrical energy. This issue may also prevent proper operation of GFCI and AFCI devices. Also, subpanels should be connected to the main panel (and/or service disconnect) with a four conductor feeder cable (two hot conductors, one neutral (aka grounded) conductor, and one grounding conductor). Older standards permitted subpanels in detached buildings (a building other than where the main panel is located) to be fed with three conductor feeders assuming a ground rod was installed at the detached building. The issue in this photo is the bare grounding conductor connector connected to the neutral terminal bar at this subpanel’s left bottom corner. Instead, since this breaker panel is a subpanel, the bare grounding conductor should only be connected to the grounding terminal bar at the far right upper corner in this photo. The rest of this subpanel’s neutral conductors (white insulation) are properly installed to the terminal bar at the bottom right corner in this photo. Honorable Mention – Electric baseboard heaters installed under receptacles – Electric baseboard heaters include instructions that forbid their installation below wall receptacles because cords plugged in above the heaters can then hang down into the heaters thereby possibly melting the wire insulation and presenting a shock or fire hazard (see photo below). Electric baseboard heater installation guidelines can be found here: http://inspectapedia.com/heat/Electric_Heat3.htm. Matthew Steger, owner/inspector of WIN Home Inspection, is a Certified Level 1 Infrared Thermographer, an ASHI Certified Inspector (ACI), and holds a Bachelor of Science degree in electrical engineering. He can be reached at: 717-361-9467 or msteger@wini.com. 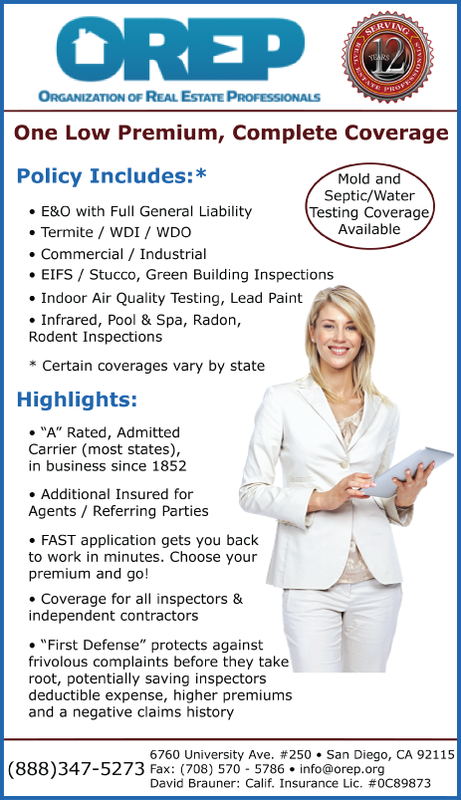 WIN Home Inspection provides a wide array of home inspection services in the Lancaster, PA area. 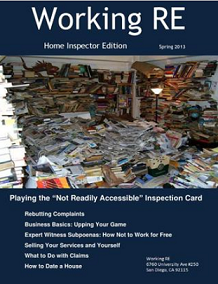 ACI WIN Home Inspection – “WE SEE MORE. CLEARLY.” ASHI Certified Inspector Certified Level 1 Infrared Thermographer Phone: 717.361.9467 Fax: 831.306.9467 Web: www.WINHomeInspectionElizabethtown.com. I had no clue that hitting a buried conduit with a shovel could electrocute you. I think that it’s best to hire an electrician to ensure that all of your electrical systems are in working order. My wife and I just bought a new home, so we’ll be sure to contact an electrician that can provide an accurate troubleshooting service. Awesome article Matt. I can’t tell you how many times I go into a house and see breakers double-tapped like in your picture above. Very nice article Matt! I like the concise lists, makes it easier to come back to later. 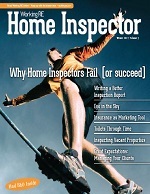 Nick Mancuso President Home Inspector Experts, Long Island, NY. Agree Good Article now lets add one for Plumbing and HVAC. Nice article Matt. Very informative. Good Job ! Steve Gladstone President, Stonehollow Fine Home Inspections Stamford, CT.